What a curious little set. All I can think of when I look at this one is "Is that so(da)?" W-What a terrible self-inflicted pun. I really wanted to write something but that pun is a definite combo breaker. Well done (golf clap). That said I find it almost unfathomable that Poliwags pun wasn't the exact thing running through the artists head when he created it. That's probably because Rumia's trademark phrase in its original language does not contain anything that sounds like "soda". Still, love the English pun. Perhaps, but it seems far too much of a coincidence to me. I'd tend to think the Artist knew some English and did it on purpose. Notice how she’s the only one out of the set that’s paired with something clearly identifiable as a soda. If all the others where also paired with various soft drinks then maybe, but it seems awfully convenient she’s the only one while the ohters are juice, water, tea, etc. We'll probably never know though. I honestly doubt our common English translation of "sou nano ka" is at all known in the land of the rising sun. As you say, though, we'll probably never know. Most Japanese people don't know her phrase in English even nor overseas people love touhou like here. And we usually don't call cola soda. 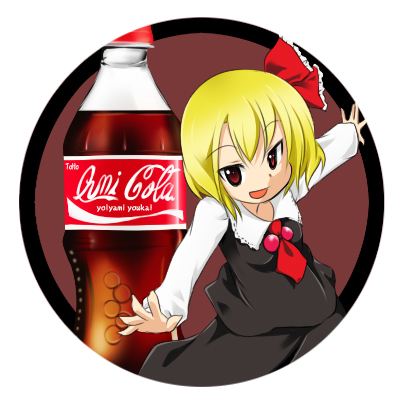 I think why the author chose cola for Rumia is only that both have same colors so it is just a coincidence. "So(da) nano ka" is it then? I think just "so-da no ka" is fine. It's even similar to the way the English phrase is modified by only adding one syllable.